giblet, congratulations are indeed in order! Fantastic news! OK, fellow FTers, let's put this over 125 lenders / 1,000 loans / $30,000! FlyerTalkers paying it back... I'll be sure to put a bug in Randy's ear tomorrow when I see him! Technically I beat you (KF8 in Manila), but congratulations! Awesome! I have lots of questions, actually, so will PM you. And the Philippines is my top choice. Do they need a rep in Monte Carlo? Programs: AA EXP "Life is good! Really good."" Congratulations! What a great thing to do. Please keep us updated. Is there a thing on Kiva that you can follow reports from specific fellows? Merrick - have you written about your experience anywhere? Seems like an interesting program (if I could take sabbatical). Can someone explain to me the risk factor. What are the chances that you will lose money. What if the lender defaults? How are you paid back such bad loans? I've been very pleasantly surprised at how many of my loans have been repaid. Honestly, I went into this feeling (and do to this day) that whatever money I put in I'll never withdraw. $25 only means skipping a couple lunches, something I likely should do anyway. It's such a trivial amount of money that I am happy to risk it in hopes that it will make a difference in someone else's life. But because I have had a very high rate of repayment, I've had a lot of fun chosing another and then another project to fund. If the lender defaults or (as seems to be more common) the local partner has difficulties you may not get your $25 back. It hasn't happened to too many people here, but it can happen. You can lessen your risk by using 4 and 5 star partners and if lending more than once, making sure you lend in a number of different countries. 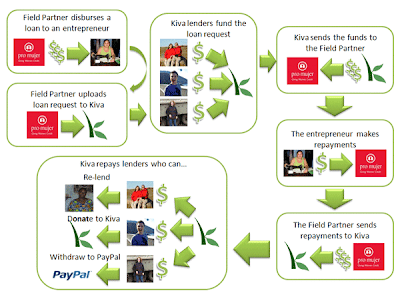 The overall repayment rates to Kiva lenders is 98.57%. Many (most?) Kiva partners guarantee (officially or unofficially) Kiva loans. If the partner is officially guaranteeing the loan, you'll see "Default Protection: Covered" in the loan profile. Even if the loan is listed as "not covered", many partners will cover defaults to keep their posted repayment rates high. Most defaults tend to be where the partner has problems (such as fraud), though Kiva staff, fellows, and external auditors conduct "borrower verification" and other audits of partners to identify any issues. Kiva Fellows normally post a blog entry every two weeks (I was pretty bad at doing it, however). You can read entries (including accounts of what it's like to be a fellow) on The Kiva Fellows Blog.